The parish of Morvern (or Morven) was formed in the early 17th century by uniting the parishes of Kilcholumkill and Kilintach. The church of the former parish was dedicated to St Columba. These fifteen sculptured stones which were traditionally brought from Iona (ONB 1872) and placed in the graveyard, have been removed from there and placed in the present church (at NM 6709 4517). Name Book 1872; I F Grant 1935. There are fifteen medieval graveslabs in the parish church. The tradition that they were brought from Iona is still known locally, but it is more likely that they are associated with the nearby church, described on NM64NE 2. Visited by OS (NKB) 11 June 1970. The RCAHMS (1980) give a full description of these slabs (one of which is the lower part of the shaft of a free-standing cross). The great majority are of the Iona school of sculpture, though two are of the Oronsay school; they date to between the 14th and 16th centuries. A description of a further seven similar slabs, and a number of 18th-century tombs, which are in the church-yard, is also given. Lochaline, Kiel Church. Built in 1898, probably to a design by P MacGregor Chalmers, A plain kirk, the Early Christian detail of the simple round-arched eindows almost flush with the walls, picked out by the contrast of the red-painted sandstone dressings against the harling. Buttress bisecting the W gable. SW porch. Simple gabled bellcote on the nave's E wall, from which projects the lower chancel. Interior with braced kingpost roofs over both compartments. Roundheaded chancel arch; deep-splayed window jambs. Stained glass: in the narrow E window, four tiers of oval panels containing portaits of Our Lord and SS. Columba, John and Paul, c. 1900, in good dark colours. The nave's NE window (The Sower) is by Roland Mitton, 1983, tepidly expressionist. NW window (Abraham) by Stephen Adm and Son, 1899. Weathered upper part of a slab with a floriated cross below reliefs of what may be a priest and a woman. Churchyard to the S and W of the church. In its SE corner, a mid 18th century headstone for the 11 children of John and Florans Cameron, the front carved with an angel's head and wings above the parents' initials and the crowned hammer (the initials of the hammermen or smiths, of which John Cameron was one), the back with a skull and thighbone. On the top of this inscription panel, eleven little heads. To its W, the table stone of John Livingstone (died 1816), the top ornament with a coat of arms, the bottom with emblems of death. Further W, two fairly ruinous burial-enclosures, both perhaps on the site of transeptal 'aisles' built against the body of the now-demolished 13th century St Columba's church. The N enclosure's S wall incorporates a pointed arch with rounded soffits carried on semi-circular reponds; this looks late medieval. Just behind it, a second wall with a blocked round-headed arch, its soffit chamfered. ; it is probably a 16th century alteration to the 'aisle'. The rubble-built S enclosure is much more fragmentary. The medieval grave slabs were Scheduled by Historic Scotland in 1999. 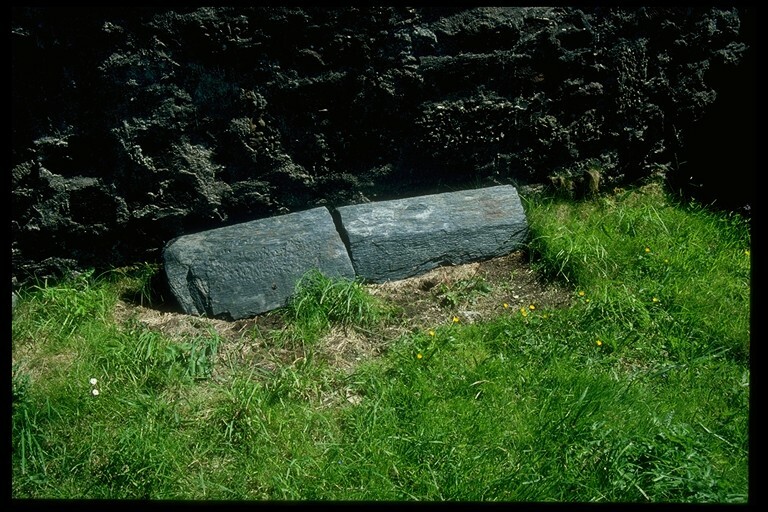 See SMR associated documents for publication by Iain Thornber, Lochaline, "The Carved Stones of Keil, Morvern, Argyll" May 2000. Grid refs and other details updated by JW 19/2/02. For old church (NM 6704 4512) and cross (NM 6709 4512), see NM64NE 2 and 4 respectively. Not to be confused with Lochaline, Keil Church (NM 6780 4509), for which see NM64NE 12. --- Text/Publication/Monograph: Gifford, J. 1992. Highland and Islands. The Buildings of Scotland. Paper (Original). 255-6. --- Text/Publication/Volume: Grant, I F. 1935. Lordship of the Isles. 228. --- Image/Photograph(s): Highland Council Archaeology Unit. HCAU Slide Collection Sheet 7. Colour slide. . Digital (scanned). 133. --- Text/Publication/Volume: Scott, H et al (eds.). 1915-61. Fasti ecclesiae Scoticanae: the succession of ministers in the Church of Scotland from the Reformation. Rev.. vol. iv, 116-18. --- Text/Publication/Volume: Thornber, I. 1975. The sculptured stones of Cill Choluimchille, Morvern, Argyll with notes on the early church and the tomb of the Spanish princess. --- Text/Publication/Volume: Name Book (County). Object Name Books of the Ordnance Survey. Book No. 71, 129.